Eric Marques walks down a steep labyrinth of dark alleyways on this hillside slum long controlled by drug gangs and off-limits to outsiders. The scrawny 13-year-old with sun-streaked blond hair dodges fast-moving motorcycles in busy, narrow streets lined with mazes of tangled electrical wire, chicken coops and fish stands until he reaches a building on the foothill where he picks up a surfboard. The wide-open sea is just steps away. "I love surfing. I love being in the water," said Marques, a 13-year-old who came out of the blue-green sea with a yellow and pink surfboard underneath his arm. He lives with his grandmother in a shack on the hillside next to a fetid cascade of raw sewage. "There's not much for us to do at home. We have a lot of gunfights. It's hard to live there. It's too crowded, so I prefer to hit the beach." Long frowned upon as a counterculture movement or a mere pastime — and for decades invisible outside California and Hawaii — surfing has spread around the world as a professional sport and multi-billion dollar industry. This month, the IOC included surfing in its Olympic program for the Tokyo Games in 2020. It's inspired the children who have heard about the athletes competing not far away from their beach. "Surfing is not just a sport. It's a way of life," said Mateus Martins, 17, another student at the Rocinha Surf School. "Having the athletes here in Brazil is an inspiration for all of us. It motivates us to continue practicing the sport." The school was founded two decades ago by surfer Ricardo Ramos, better known by the kids as "Bocao," or "Big Mouth," because he loves to chat. He used to sell hot-air balloons filled with fireworks to neighborhood drug dealers who used them to celebrate birthdays or when one of their own was released from jail. Then, he began surfing and decided that he wanted to give back to his community. His idea: to teach impoverished children and adults with disabilities to surf to keep them away from drugs and violence. Ramos says the school is funded by donations, including from Hawaiian musician and former pro surfer Jack Johnson, who visited in 2014. The school also offers mountain hiking, English lessons and music classes. "Their communities have been abandoned for decades," Ramos said. "When they go home, they face the troubles of their lives." 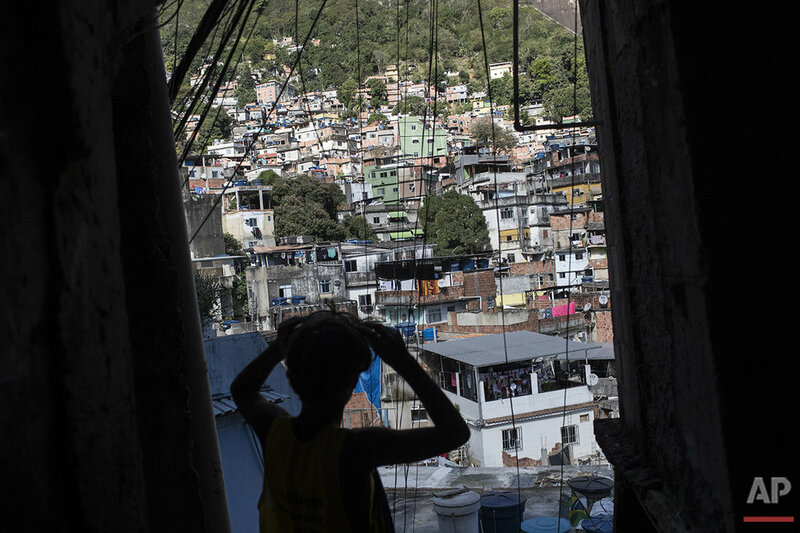 Rocinha has been part of a pacification program aimed at making Rio safer ahead of the 2014 World Cup and the Olympic Games. But heavily-armed drug dealers still plague its alleys and deadly gun battles often break out in the slum, known here as a favela. A police car with a busted window partly covered with plastic was parked outside the school on a recent day. Military police with assault weapons patrolled the main street leading to the slum. Although it's known as a top surfing spot, the Sao Conrado beach was removed from the list of venues from a surfing competition earlier this year due to pollution. Jammed between the high-rent Barra da Tijuca and Leblon neighborhoods and the Rocinha slum, it is among Rio's dirtiest beaches. Most of Rocinha's sewage flows untreated directly into the water. Last year, a ruptured pipe unleashed a putrid fountain of untreated waste that gushed down a rocky outcropping and into the water, creating a giant brown stain. "The kids often get mycosis, white spots on their skins," Ramos said about his students, who surf without a bodysuit and just wear board shorts. "But there's nothing we can do about it ... favela surf has no luxuries." The lack of basic sanitation in this city of 12 million people is mainly due to bad infrastructure and chaotic urban planning going back decades. A massive cleanup of all Olympic aquatic events was marketed as one of the main legacies of the Games, but testing by The Associated Press found widespread contamination remains. The lack of progress and the dismissive attitude of local authorities shocked many and grabbed the spotlight because Olympic athletes compete in the polluted waters. In slums like Rocinha, contact with untreated waste is an everyday reality for the more than 70,000 residents. The teens at the surf school spend much of their time picking up garbage on the beach. It's their contribution to clean the polluted waters swarming with dangerous viruses and bacteria. "We know that our country's politics are not very good, so if we all do our part, it helps us all," Martins said. "The cleanup is a form of education. Not throwing your garbage on the floor is way of being a true citizen." Their cleanup work done, a group of barefooted teens hustle from the concrete streets outside their surfing school to the wet, soft sand. They strap leashes from their surfboards to their ankles before they paddle out to the blue swell. Brimming with joy on the water, they wait for the break. They think about their heroes. A wave of Brazilian surfers has been riding high to the top of the global surfing elite. Gabriel Medina became the first Brazilian to win a World Surf League Championship title in 2014. A year later, Adriano de Souza beat him to keep the world surfing title at home. One day, they hope, they will be that good, too. "The surfers of Rocinha are really good," Martins said, beaming with pride. "They have a great chance to make the Olympic Games of 2020. If everyone believes, and trains hard, a champion can come from Rocinha." Text from the AP news story, At a school in Rio's slums, kids surf in toxic waters, by Luis Andres Henao.